It was no sleepy Sunday for ClarinetFest 2014 at Shaver Theater this morning, where another Lagniappe Recital showcased several excellent performers and their eclectic choices of music, including several works with electronics and visuals and a world premiere piece for solo bass clarinet. Marianne Gythfeldt, Anne Watson, and the Myth-Science Ensemble all performed for a supportive and patient audience despite the recital’s late start. Dr. Marianne Gythfeldt, an Assistant Professor of Music at Brooklyn College, started the hour with Mikel Kuehn’s Rite of Passage followed by Gene Pritsker’s Modified #4. The audience was surrounded by stereo electronic sounds while Dr. Gythfeldt played live passages from the center of the stage. Her use of a laptop and panel of foot pedals enabled her to change the electronic sounds as the music progressed. Dr. Anne Watson of Northeastern State University (Tahlequah, Oklahoma) continued the recital with the world premiere of Theresa Martin’s Grit n’ Grind for bass clarinet. Dr. Watson briefly described an intense exercise routine, involving crawls through the mud, which prompted Theresa Martin to compose the work. The piece’s call for steady technique throughout the bass clarinet’s registers was highlighted wonderfully by Dr. Watson’s playing. 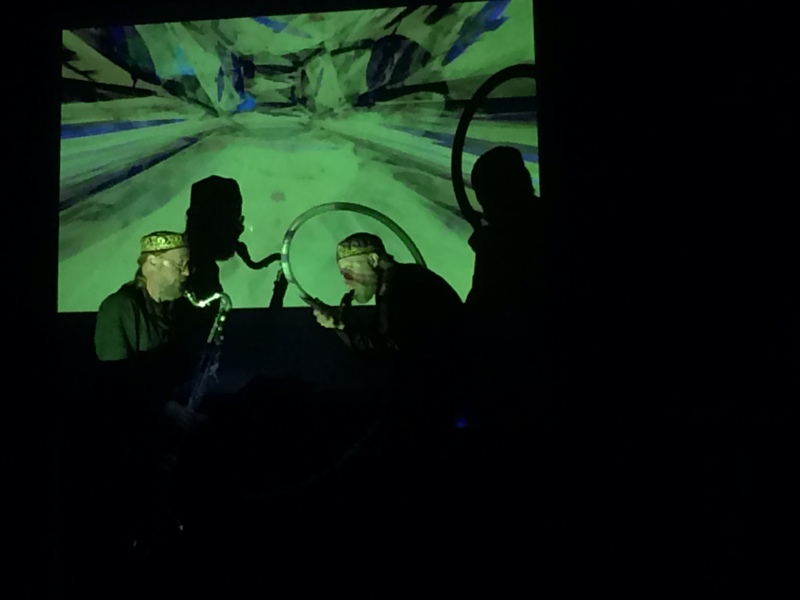 The final works of the concert were presented by the Myth-Science Ensemble of Dwight Frizzell and Thomas Aber on bass clarinet, zwoom, and electronica. Their first work Slippages III was accompanied by brilliantly-colored visual presentations as a backdrop for the performers. Frizzell discussed the directional approach to the work’s amplification, where a unit of sound may be played live by Frizzell or Aber and then repeated behind them on electronics or vice-versa. The use of zwooms, a long circular tube with bass clarinet mouthpiece, produced a dark and shrill sound similar to a contrabass clarinet, though their movement of the instruments varied the timbre. The second work Oceans of Kansas was aptly named for the audio samples of certain reactive minerals and chemicals used in the piece. Aber provided whimsical bass clarinet sounds and passages while the visual and audio presentation of the piece carried on. Joel Auringer is a recent graduate of Southern Illinois University Carbondale. He currently maintains a private studio in the Dallas/Fort Worth, Texas metroplex, and will begin doctoral study at the University of North Texas in the fall. One strong point of ClarinetFest 2014 has been the array of excellent performances on bass clarinet, often showcasing new music for the instrument. This Lagniappe Recital was a shining example of that. 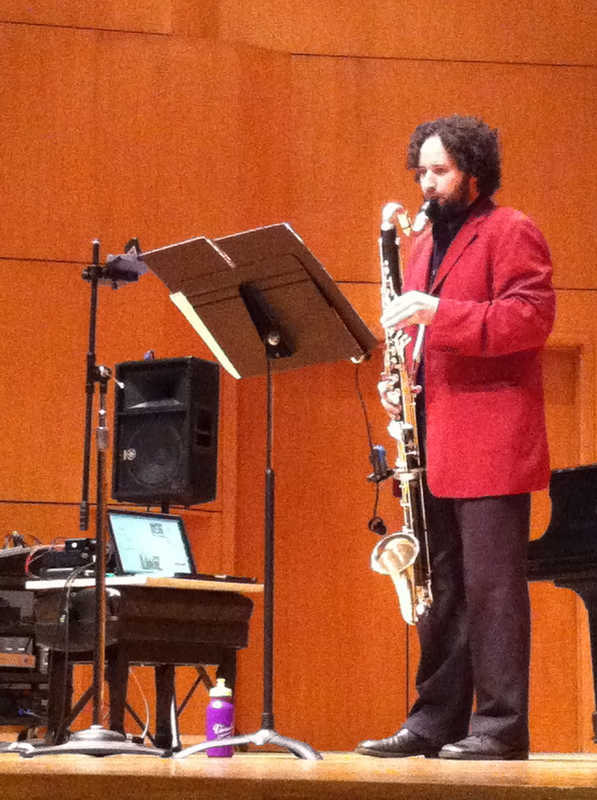 Barbara Haney and Jason Alder performed Daniel Dorff’s In a Deep Funk: Dance Set for Solo Bass Clarinet and Stockhausen’s Solo für melodieinstrument und Rückkopplung, respectively. In a Deep Funk featured four movements with a play on popular dance crazes from the middle of the last century, called Hustle Misterioso, Twist Variations, Bear Hug, and Funk Scherzo. The music was sometimes raucous and sometimes singing, but always had an underlying groove. Barbara Haney played very convincingly, executing the large leaps and use of the full range of the bass clarinet with great ease. Solo für melodieinstrument und Rückkopplung (Solo for a melody instrument and feedback), although composed in 1966, was still new to most people in the audience. In the day and age when Stockhausen finished this work, it required at least four people in addition to the soloist to create the feedback that is key to the piece. Through countless hours of computer work, Jason Alder created a system in which to perform the piece by himself. Alder surrounded himself with a laptop, his phone, which provided an audio and visual metronome to cue him for the beginning of each musical cycle, and a microphone attached to his bass clarinet. The third time was a charm; technical difficulties required Alder to start the piece a few times before everything worked properly, but once it got off the ground, Solo took over the recital hall. At times, the feedback from the bass clarinet sounded like a string section. Other times, feedback that was a more exact copy of Alder’s original sound accompanied him to form unusual chords and polyphonies. Before beginning to play, Alder pointed out that there will never be two identical performances of Stockhausen’s Solo since he provides several musical sets which are to be paired together through the feedback in any combination of the soloist’s choosing. We have Alder to thank for the ability now to perform this very interesting work as a true solo, as well as for bringing it to our attention. Alaina Pritz is a recent graduate from The University of Maryland and currently plays with The United State Air Force Band – Band of the Golden West. 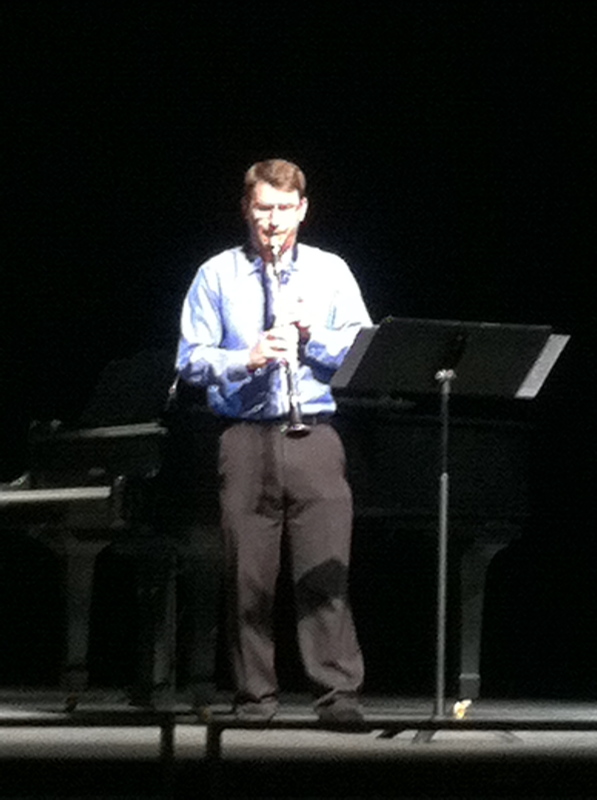 The Lagniappe Recital in Shaver Theatre Sunday at 12:00 featured new music for the clarinet. Andrew DeBoer opened with Nikola Resanovic’s Sonata for B-flat Clarinet and Piano, a bluesy but modern work featuring everything from glissandos to flutter tonguing to sections that sounded like Baltic folk music. The piece is in four movements that blend together: “I. For the Money… II. To Go… III. To get Ready… and IV. Go Cat, Go!” DeBoer’s playing was clean, controlled and thoughtful. Next, Lisa Oberlander performed Roger Zare’s Nocture étincelant and James Primosch’s Times Like These. Oberlander executed the soaring melodies and gentle chalumeau passages in the first work effortlessly. The second piece called for several adjustments to the piano including wrapping a piece of felt around two strings to achieve a wood block sound and wrapping a paper clip around another string. At times throughout the piece, pianist Tatiana Muzanova placed fingers on strings to bring out the harmonics. She also created an odd effect by pedaling slightly after playing a chord, which caught some of the notes and harmonics but not all. The duo played expressively to make for a successful pairing of works. Maryanne Lacaille performed Nikola Resanovic’s Alt.Music.Ballistix next. A wild piece with prerecorded sound effects that were broadcast in stereo in the theater — including a fax machine, a dial tone, a car crash, a typewriter, a dial-up modem login, drums, a tambourine, an accordion, and an automated voice asking the caller to enter a password and the pound sign — accompanied Lacaille as she laid out several complicated passages on her clarinet. The vibrant music seemed to match the purple patent loafers she wore, and the LSU bell tower chiming the time in the distance during a pause in the music created a surreal effect. Matthew Nelson and Vanguel Tangarov closed the recital with Bruce Quaglia’s After Milton: Three Vignettes for B-flat Clarinet and Bojidar Abrashev’s Recitative and Burlesque, respectively. The performers executed both very demanding pieces with great skill and musicianship, especially in regards to the delicate high notes at soft dynamics in each one. Audience members took away from this concert excellent additions to their lists of performance repertoire and a refreshed inspiration to pursue new works for our instrument. What an amazing recital! 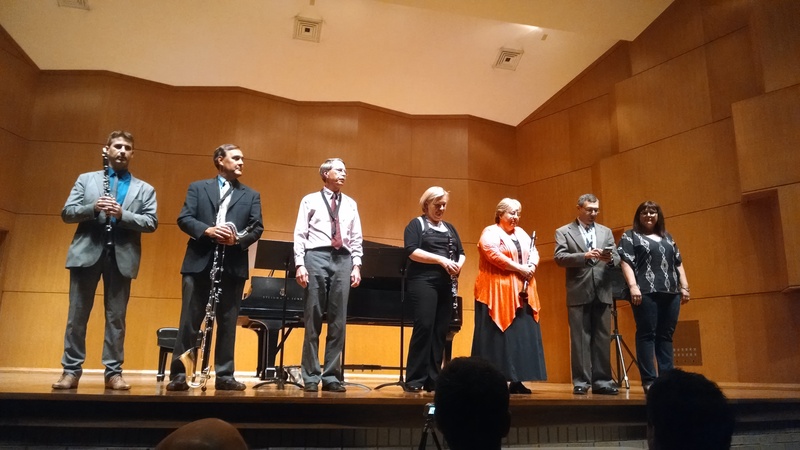 This performance offered audiences a chance to hear many different selections showcasing the different timbres and extended techniques of clarinet. Unfortunately Sergio Reyes was unable to attend so the first performance was the Invisible Duet by Fredrik Högberg, executed from memory. This work is performed with a prerecorded track and has the soloist walk onstage with the clarinet in its case so it is assembled as part of the show. The performer is then called to speak the single line, “Meditation begins.” The meditation is quickly over and the performer is off to the races. This piece truly is a stage production that seems based on the premise that the clarinetist is playing a game trying to beat the level titled “Invisible Duet.” At the completion of the clarinet part, the voiceover track says, “Invisible duet complete. Well done.” The performer then walks off the stage as the track concludes. Second on the program was Bug by Bruno Mantovani performed by contemporary music specialist Spencer Prewitt. This performance was virtuosic and demanded flutter tonguing, timbre trills, and quartertones from the performer. Prewitt played with fire under his fingers and definitely depicted the imagery evoked by the title. Radovan Cavallin Zerjal closed the recital with three works: Pastoral Fantasy for Solo Clarinet by Croatian-born New York native Božidar Kunc, Monolog for Solo Clarinet by Andjelko Klobučar dedicated to Zerjal’s father, and 11 per 1 in 1 for Solo Clarinet by Dubravko Detoni dedicated to the performer. Zerjal’s stage presence and artistry captured the audience from the moment he walked onstage. His first piece truly highlighted his sotto voce range and dynamic dramaticism while subsequent works displayed his ability to flutter tongue while singing, circular breathe, and use body language for dramatic effect. All three of these performers displayed extreme technical mastery while also making evident their compelling passion and individual musical statements. Jennifer is a member of the United States Air Force Band of the West and is also finishing her DMA at the University of North Texas with Kimberly Cole Lluevano. Left to Right: Stephan Vermeersch, Tod Kerstetter, Keith Koons, Caroline Hartig, Maxine Ramey, John Cipolla, Lisa Canning. I.C.A. President John Cipolla opened the board recital with repose and respect, honoring the young performers injured and lost in an accident the previous evening. In one accord the room was silent and reflective, lifting the victims and their families up in prayer and meditation. Without delay, Lisa Canning gave the opening address, reminding the room of the festival’s theme, entrepreneurship. Her words were inspiring, urging current musicians to “be a beginner [again]…be vulnerable [and embrace] new thoughts for a new day.” We all have other gifts to be combined with our clarinet for “it is not the only tool needed to build a house.” The musical medium is for more than the performer but also the inventor, businessmen and women, teachers, and advocates. Canning encouraged musicians to be ambassadors for the arts as they enter, and I might add, keep the arts. Following the address, we once again heard from John Cipolla, the day’s first performer. He performed The Voice of the Onion by Kenneth Berger, assisted by Zachary Lopes on piano. The unity in their tutti passages was full of color, accentuating the jazz overtones within Berger’s work. No surprise as Berger is at home writing in the jazz idiom and the depth that Cipolla performs. Immediately following, Caroline Hartig took stage, lightening the seriousness of performance with a small quip before performing Carlo Pedini’s L’Acciarino Di Weber per clarinetto solo. Her lines were fluid and her presence commanded your attention. The audience was so delighted with her execution, premature applause interrupted the final phrase of playful and impressive flourishes leaving her tickled and assured of the undeniable sparkle in her performance. In a brief departure from treble sonorities, Tod Kerstetter took the stage with bass clarinet in hand to play Roger Jannotta’s transcription of Improvisation on “God Bless the Child” by Eric Dolphy. Kerstetter captured the thrill and nuance of improvisation with his fluid technique and raucous interjections of strength and power. One can only imagine there will be a flood of young clarinetists seeking out more bass clarinet repertoire in their training because of it. Revisiting more traditional roots, Donald Oehler (clarinet), Keith Koons (basset horn) and Seong Eun Kim (piano) presented their interpretation of Concertpiece No. 2 in D Minor by Felix Mendelssohn. Being arranged for many instrumentations, it was refreshing to hear the piece brought back to its origins, showing the depth, color, flexibility of the basset horn. Veterans of collaborative performance, The Sapphire Trio (Maxine Ramey-clarinet, Margaret Baldridge-violin, Jody Graves-piano) performed the first movement of Serenade for Three by Peter Schickele. Pristine in execution, the audience marveled at the communicative power and ease at which the group performs. Established in the late ’90s, The Sapphire Trio has had many notable performances, making ClarinetFest2014 one of many stops in their highly successful career as chamber musicians and entrepreneurs. The recital ended with the same Bagatelle for Solo Clarinet (2004) by Alexei Pavlyuchuk performed by Stephan Vermeersch. The frenetic work was full of excitement and fire, making the percussive and punctuated slap tongue of the final note seem misplaced, yet strikingly satisfying in the textural juxtaposition. The necessity of a new music recital with various types of ensembles and contrasting instrumentations cannot be overlooked for an entrepreneurial conference, and this recital unabashedly embraced the diversity. Melissa Morales is a master’s student at DePaul University studying with Julie DeRoche and Larry Combs. She currently teaches at The People’s Music School and performs with The Candid Concert Opera’s Orchestra Nova and the Chicago Symphonic Winds.